Get ready for the mack daddy of all Big Macs. McDonald's is rolling out two new sizes of its most iconic sandwich, for a limited time. The Big Mac will be joined by the Mac Jr. and the Grand Mac at McDonald's restaurants nationwide starting in early 2017. 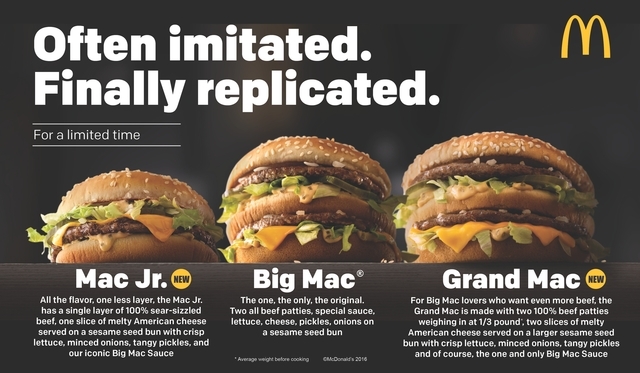 The Mac Jr. will have a single patty that the company says is "slightly bigger" than its typical patty and it doesn't have a third bun in the middle. The Grand Mac is built like a typical Big Mac but with patties that add to about one-third pound of beef. The new sandwiches were tested at restaurants in Ohio and Texas earlier this year. Customers in Florida and Pittsburgh will get to try the new sandwiches later this month. See the new sandwiches in the promotional image below.